I know, that’s a big claim. 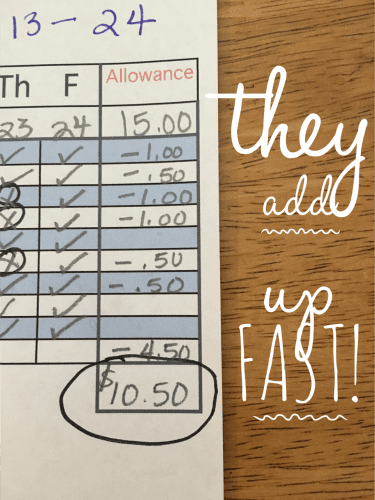 But I can’t tell you how many chore methods I’ve gone through trying to find the perfect way to keep track of my kids’ chores AND keep them motivated, and now I think I’ve done it! Of course something this good I can’t keep to myself, and included all the details to share with you. We’ve even got a free printable for you at the bottom of this post! 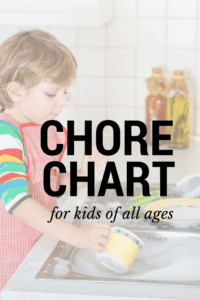 Finding the perfect chore chart for kids doesn’t usually result in a one-size-fits-all solution, but this one will either do the trick or come as close as it gets! It’s super customizable for all ages, ability levels, and job types, something I just wasn’t turning up in my searches. Huge thanks go to my awesome sister for introducing me to it. This is a blank two week chart on a simple spreadsheet that I print out. All you need is paper and a pencil. There are no magnets, hole punches, or clothespins involved – it’s not cute, it’s efficient. If you need cute I suggest you buy some stickers or washi tape for it, or add personal drawings from you at the bottom. A sample completed chart for reference. Don’t judge. There are nine spaces to fill in whatever chores, tasks, or behaviors you want for each child. Ours are known to change a bit in the summer, or at certain times of year when we need it to. If you need to change your chore list, just adjust your spreadsheet before printing. Easy-peasy! Of course, you don’t have to fill in all nine spaces. We do a checkmark for completed chores and an X for incomplete chores. Every night I check chore status after the boys are in bed. At the end of the two weeks time I circle all the X’s (incomplete chores) and total them up in the far right column. If a chore is not done by them, that usually means Mom or Dad had to do it, and we charge premium rates – .50¢ for every chore left undone, and that comes off their allowance total. Their grades at the end of each two weeks time are what set the allowance amount. My kids’ grades are easily accessible online, so I just pop over and check before allowance day to start adding up their tally. I’ve found this motivates kids to study a bit harder, because they know in just a week or so it can really affect their allowance. Before this chore chart, a point I was having a hard time getting across to my kids is that in this society, better grades equals better pay. But that motivation might not be the message your kids need to receive, and that could change for my own kids down the line. If so, all you need to do is tweak the dollar amounts for grades to what works best for you. 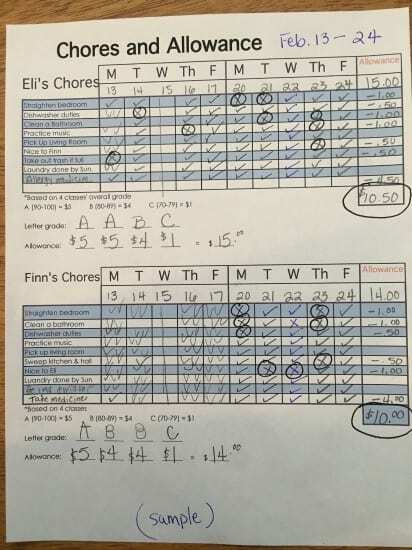 At the moment, the maximum my kids can make every two weeks if they make straight A’s and do ALL nine of their chores every day is $20. They get $5 for an A, $4 for a B, and $1 for a C. To me, in this moment, that’s a dadgum bargain. For you, that might be setting the bar too low or too high. Just make this chart your own is my point, and feel free to change the stakes at any time – you’re the parent. Keep in mind the allowance amount is for every TWO WEEKS. So you’ve set your chore list and recorded all the done and incomplete chores for two weeks. Now, how do you calculate your kid’s allowance? First you have to determine the allowance using the grades. Add up the dollar amount and record it in the top right corner of each child’s chart. Then, make your allowance deductions by seeing how many Xs are on each child’s chart. Carry them over in the right hand column. This is an important visual for your child. Deduct the incomplete chores from your allowance totals and that’s the allowance for that two week period. Do this part with your child for maximum effect. Tally your chore chart with your child. Pay them in singles how much they have earned with their grades. Count the incomplete chores with your child. Have THEM pay YOU what they owe for incomplete chores. Watch the realization dawn on their sweet faces that mama’s labor don’t come cheap. You’ll only have to do this a couple of times for the message to be received in most cases. The other thing I love about this chart is it has drastically cut down my nagging after the first few two week cycles. If the chore isn’t done by the pre-designated check time, it gets an X. I do it after my kids are in bed, so they know if their list isn’t checked off before bedtime they get an incomplete, and they’ve had all day to get it done – plenty of time. On Allowance Day all those X’s add up, so it’s just easier to get it done before bed. No nagging needed! My expectations are super clear and easy to remember. Granted, my kids had to learn this the hard way and yours probably will too. DOWNLOAD a blank customizable Chore Chart here (PDF). Let us know how it works for your family and any useful hacks you find! « A Mom’s Guide to Guarding Her Heart	» How to Survive Regional Travel with Small Kids… Plus a Map! sounds great for school year, but what do you use as motivation in the summer (i.e., no grades)??? For the first 2 weeks of summer I base grades off their last report card, either last 9 weeks or annual overall – your choice. The next sets of 2-week periods I’ve been using their summer workbooks for their grades. I take into account if they completed their work without me reminding them as well as the quality and correctness of the work. Also – you could substitute a summer reading log in for schoolwork as well. I’m even going so far as to ask my incoming 7th grader to write an essay on his assigned reading book before school starts. Hi! I see it says customizable, but it downloads as a pdf. Do you have it in an editable format? It says Finn at the bottom and I would like to change the number grades… as my son receives a different type as a second grader.